Do you have/know a sweet little lady who loves to mommy all of her dollies? I do. My little girl likes to wrap her dollies and animals in blankies, feed them, change their clothes………..and yes, their little diapers too. It really is priceless to watch. So I have seen these mini diapers around a number of places and just had to make some. Well, he’s known as Curious George to most. But when my little girl couldn’t say “monkey” or “George”, she would say Ahh-Ahh. You know, the sound a monkey makes…….”Eee Eee, Ahh Ahh, Oooh Oooh” Well, it was shortened to Ahh Ahh and now that’s her little buddy’s name. Forever. Then, try it out on your doll/stuffed animal to make sure it fits and doesn’t need any adjusting. Then lay this piece on top of your lining/inner fabric and cut out another piece the same size. Then sew these two pieces together, with right sides together. Make sure to leave an opening so that you can turn it right side out. Then turn it right side out, fold in the open section, iron it flat, and then sew all the way around…..really close to the edge. Then sew velcro onto the front and the two side flaps. those are precious! My girls would love them! So cute, so sweet indeed! I've inteded to make little diapers for the little dolls ere in the house for a long time, thanks for reminding me. Really cute! VERY cute! You should have this as a "giveaway" for those of us who are "sewing-challenged". That is cute. I'll have to make some for my daughters toys. Also I wanted to know if I could get your baby tie pattern? I didn't see it on your tutorials and I really need one for my 16 month old son for church. Go ahead and e-mail me if you want. Glad you guys like it. They sure are fun for the little gals. Me and My Family – Sorry, I only offer the finished tie for sale in my shop. If you're interested, check out all of the styles in my shop. Those are awesome! I will be making these when my baby girl gets older! Soooo, adorable! You should sell on Etsy! You are the tutorial QUEEN! Love this! Love his name and love the diapers! So cute!! My daughter would LOVE these, she is always wanting diapers for her babies! I'm making these for my daughter for her (4th) birthday! My mom got her a dolly that can wear 0-3mos clothes (so much cheaper at a garage sale or on clearance than real dolly clothes) and I'm sewing accessories. I'm sure I could've figured it out but your tutorial is awesome. Thanks! So cute! I know some little girls who would go nuts over this. I'll be linking. I just had to laugh when I read this post! My son also has a monkey that he dresses up in dolls clothes – his name ??? Ooohh Aaahh Aaahh!!! Love your blog and the tutorials are awesome! I have been putting off trying to work out how to make some reusable (and cheaper!) diapers for my daughter's Baby Alive. Now I don't have to use my own brain power – yay! You make EVERYTHING look so easy! I only wish my sewing machine was working so I could try this one! But won't my little girl be so surprised to find a pile of diapers ready for her babies when she goes to play during quiet time? This is great! One of my nieces likes to diaper her doll (the kind that pees!) and her mom buys Target diapers for it. I'm going to make hew a few of these. Much more eco friendly- and way more cute! this is adorable. I will definately have to make one! With a 3 yr old granddaughter, I'll be able to make stuff like this now…thanks for the idea. THANK YOU FOR THIS! We were using a piece of white felt and safety pins….it was a disaster! My daughter has been carrying aruond that exact George since last December and only wants to watch/read dvds/books with him in it. I'll def. be saving this for future use as I'm sure she'll be dressing him up in a year or two! With a link to this tutorial! That's too funny my daughters monkey is Ooh Ooh Aah Aah. Thanks for the great idea. Cute. My daughter who's 21mos also calls monkey's aah aah's :) Because I make cloth diapers I was over thinking doll diapers– they'll be so much quicker without elastic, which isn't even needed. Thanks! My daughter will love having cute little diapers for her baby doll. Thanks for the great idea! Oh man, this is hilarious! I need to make some for my friends' daughters dolls!!! Thanks for sharing excellent tutorial. My 2 yo dd pretends to change her Elmo doll’s diaper multiple times a day, so I just finished whipping up one of these for her so she has a non-imaginary diaper to use on him. Can’t wait to show it to her tomorrow! Thanks! Just HAD to tell you ….I LOVE THEM!!! OMGTHEY ARE SOOO PRECIOUS! going to make some NOW for my daughter’s babies! Hey! Did you ever get an answer to this question, or end up making adjustments for a Bitty Baby? I am trying to do that same thing! Thanks! I just made up some of these for my daughter, and we love them! I asked her if she would like a dolly diaper and she said, “ten please!” What a hit. Thanks! 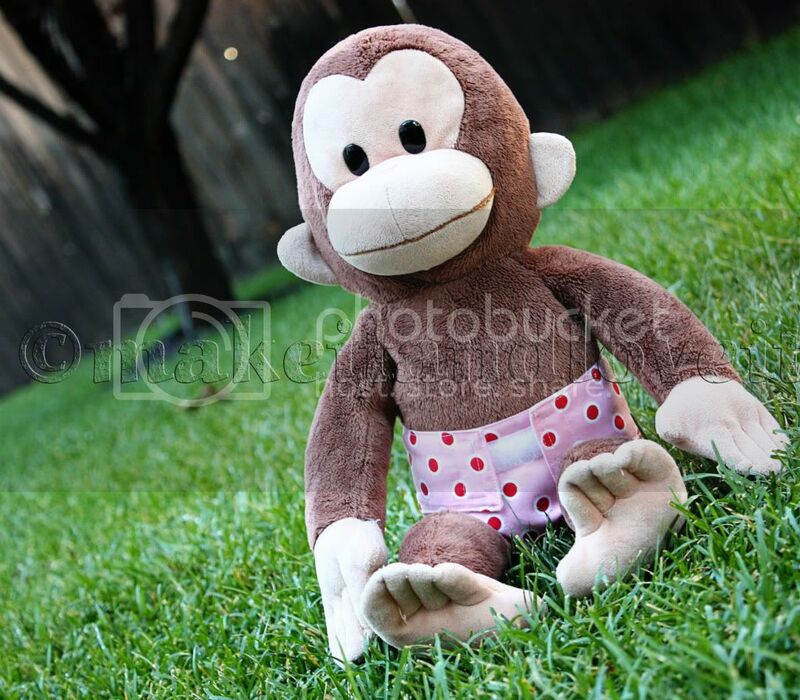 That’s so cute – my little girl calls her monkey “Oo Ee” , and we will definitely be making some diapers! Thanks for this tutorial! I have just made a diaper for my daughter’s doll as part of her birthday present. Thank you so much for the great tips! It was really fast and easy to make.